Yesterday was the fifth anniversary of the day our Margaret went into the hospital with pre-eclampsia, a dangerous, scary condition that can happen in pregnancy. I've written about it here. There isn't a moment of a day that I am not thankful. Our Hallowe'en this year was a perfect celebration of the miracle of Margaret and Hazel. It wasn't planned, which in a way made it all the more special. All the families were together except for Matthew and his mother. For two years we've spent Hallowe'en with Michael and Estée and the boys. In the town next to where they live the tradition is a walk down the main street and trick or treating at the stores. Adults and children alike are in costume. The street isn't open to car traffic for a couple hours. It is a wonderful event. In 2016 the family dressed as characters in Jurassic Park. 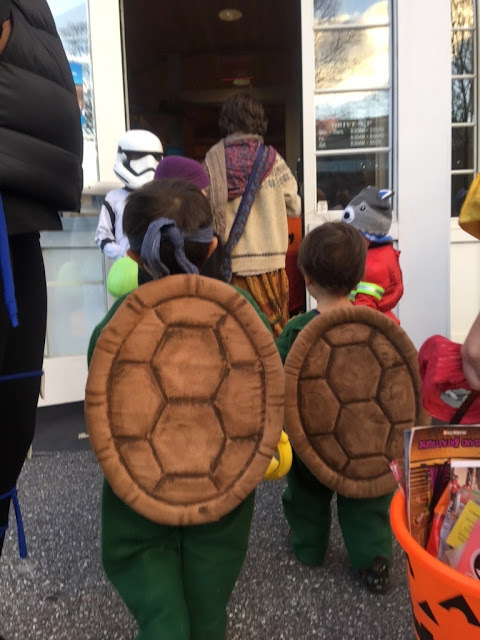 And last year Campbell and Indy were Ninja Turtles. Hazel's Hallowe'ens have been spent trick or treating in our town, going first to her other grandmother's house. Yesterday we happened to stop by to see Margaret and Hazel on our way to the boys' Hallowe'en. Even after a whole day at school, she decided she wanted to come with us. So she packed up her costume, and she and her mother hopped in the car and we were off. We all had so much fun. The kids were older so could walk more of the street. We visited a haunted house that wasn't too scary for the little ones. 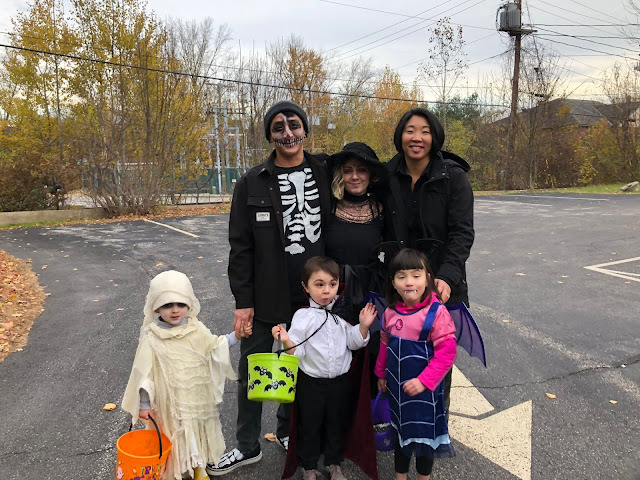 We saw some really creative costumes - Wolfman and his son, a baby dressed as a mouse in a trap, a child hotdog and her mother wearing a ketchup sign, Sherlock Holmes. All ages and sizes of people. One little girl was Vampirina, as Hazel was, and they were both delighted. Campbell was a vampire and Indy a ghost. I had the happiest Hallowe'en of my life (so far)! And I'm pretty sure everyone else did too! Oh, thank you!! I am so, so lucky they are all so close. Goodness, they are all adorable (even the adults!). The ghost costume is very creative -- those dark eye circles just make it work. We do "Halloween on Main Street" in my town, too. It's a lot bigger production (live DJ, etc. ), but yours looks just right. I do like how it brings the community together! Yes, Estée has a gift for creativity and for sewing!! The celebration does indeed bring together the community! 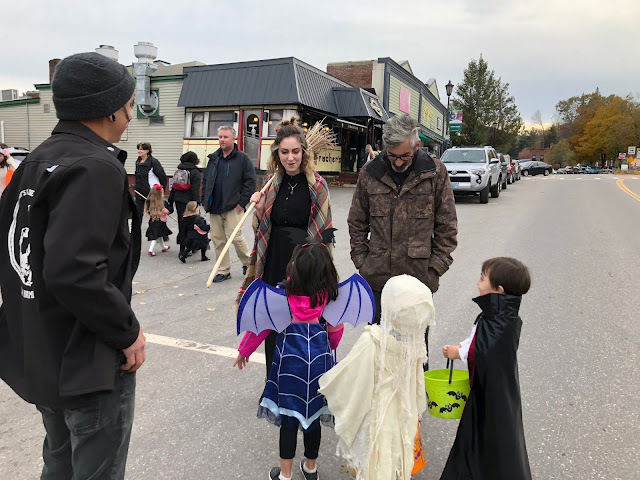 This is the biggest town in the area, and Hallowe'en brings people from many surrounding towns. What great costumes! 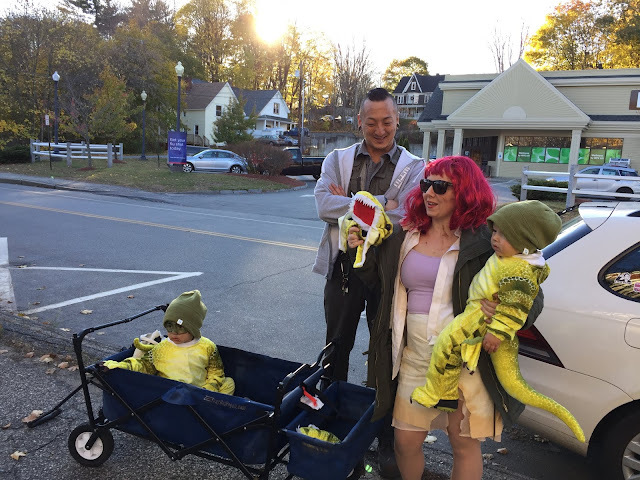 Did you and Tom have costumes also? Let us see! Your grandchildren are growing up so quickly, I remember them so well as babies! Love the idea of having the parade and closing it to cars. No. We aren't costume kind of folks! They are growing fast. This has been such a year of change. Once school comes into the lives, it makes a big difference. The cousins don't see each other as much as they used to, so it was very special to get together. And thank you! Wow, bet you guys had so much fun! What cute little vampires and ghosts! I'm amazed at the creative costumes these days. We had rain on Halloween night and so no trick-or-treaters (not that we ever get very many). The temperatures on Halloween can vary so much here. Sometimes very cold and sometimes quite warm. I remember one year that my daughter was so upset when I made her wear a coat over her costume. She was Cleopatra and she had lots of sparkles, etc. However, a cold front had blown in and it was windy and very chilly. I told her that it was either that or we couldn't trick-or-treat. She wore the coat. Ha! Our Hallowe'ens can vary in weather too, but in my memory it is mostly cold, often raining or snowing, but that's what makes it fun! Having the time change later makes a difference because it isn't dark for the very little ones. Hazel had some kind of shirt under her costume, and probably the boys did, too. They are all so cute, Nan! What a rare thing to get so many of your family together to celebrate. 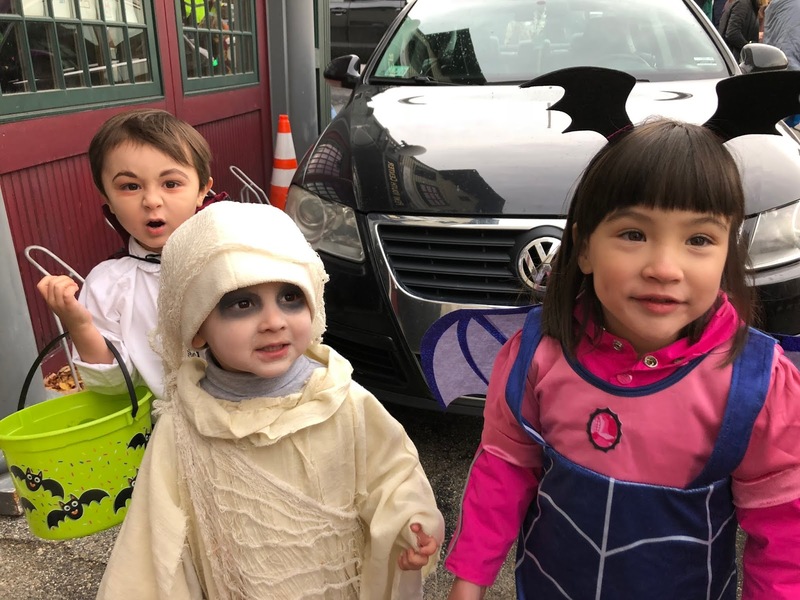 Obviously you had as much fun as they did, even though nothing really can exceed the excitement of little ones getting to dress up in costumes and playact and come home with candy to top it off. I think our little granddaughters and their parents were different members of the Star Wars ensemble. And the 3 year old also wore a witch's costume to school that her mother wore when she was her age. The two pictures of them side by side showed that they were practically twins. I'm afraid I never saved my own kids' costumes. Did you? I love it that she wore the same costume!! Isn't that just so wonderful! No didn't save costumes. They were much less elaborate (and creative) than now. A sheet sufficed for Margaret's first Hallowe'en. ;<)) I wish I had saved Wonder Woman and Superman, though! Your Grands are a perfect age for Halloween. So glad the weather cooperated and you could attend. Such great costumes and just adorable pics. All of your grandchildren had wonderful costumes, but I have to say that Campbell was a perfect vampire. What fun! Thank you! It's his drawn-on eyebrows that do it, I think!! Such fun! So different from the imported commercialism Halloween means over here; I can very well do without that, but I know I would have LOVED your kind of Halloween as a kid (and probably later on, too). I'd like to know more about the "imported commercialism". As a kid, we went door to door, and most kids still do now. Now *that* is the perfect way to celebrate Halloween. Kudos to that town for keeping alive this marvelous tradition. Your grands are adorable.... and I need not say how happy for you that the events five years ago ended so incredibly well. Thank you, Sallie. You always say just the right thing!